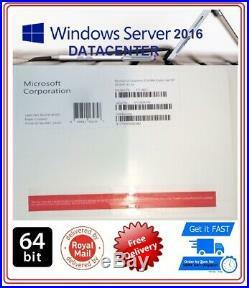 Microsoft Windows Server 2016 Datacenter 16 CORES 64BIT DVD & COA + RDS + CALs. INCLUDES OPTION 50 REMOTE DESKTOP SERVICES. + 50 USER CALS + 50 DEVICE CALS. 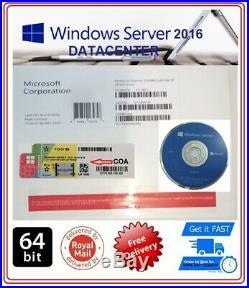 Windows Server Standard 2016 Standard Full Version. Product Name Windows Server 2016 DATACENTER. 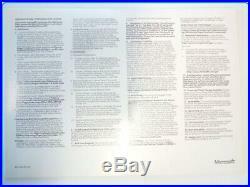 Package Type COA & DISK (FACTORY SEALED PACK). Distribution Media/Method DVD-ROM + COA. Product Type Operating System / 64-BIT. Platform Supported PC Windows Only. License Type Complete Full Edition Version. With its built-in virtualization functions and enhanced Web capabilities, the Windows Server 2016 Datacenter Edition is designed to increase the reliability and flexibility of your server infrastructure. Powerful tools give you greater control over your servers, and streamline configuration and administration tasks. Plus, enhanced security features work to harden the operating system to help protect your data and your network. 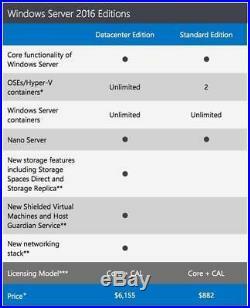 The Windows Server 2016 Datacenter Edition includes complete Windows server functionality with unlimited virtual instances. Security At The OS Level Windows Server 2016 DATACENTER includes built-in breach resistance to help thwart attacks on your systems and meet compliance goals. Even if someone finds a way into your environment, the layers of security built into Windows Server 2016 limit the damage they can cause and help detect suspicious activity. New applications stretch the operational fabric and create infrastructure backlogs that can slow business. As organizations push the boundaries of highly virtualized environments, they can use Windows Server 2016 capabilities to meet operational and security challenges, freeing up IT resources to plan a strategy that uses the cloud for future applications and solutions. Application Innovation Windows Server 2016 DATACENTER supports application innovation using container technology and microservices. Containers can help speed application deployment and streamline the way IT operations and development teams collaborate to deliver applications. In addition, developers can use microservices architectures to separate app functionality into smaller, independently deployable services, which make it easier to upgrade part of the app without affecting the rest. 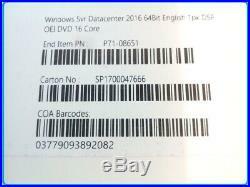 THIS IS FOR GENUINE DVD & COA FOR SERVER 2016 DATACENTER (PLUS CALs). Please Note: Microsoft's Distribution Agreement for System Builders states that the system builder software packs are not intended for distribution to end users unless the end users are acting as system builders by assembling their own PCs. A "system builder" is anyone who assembles, reassembles or installs software on a new or used computer system.